On today's Google Webmaster Central office-hours hangout, a question was why the Search Console will show you are ranking for a particular term, but when you search for that term in Google your website is nowhere to be seen. Published: Feb 12, 2016. 12:52 +0100. On today’s Google Webmaster Central office-hours hangout, a question was why the Search Console will show you are ranking for a particular term, but when you search for that term in Google, your website is nowhere to be seen. What the person is saying, is that using the example above, the term “Best Host News” ranks as number one in Google in the search console, but when you click on the “Link to the SERPs,” the website is nowhere to be seen. You can access this screen from your Search Console and select Search Traffic -> Search Analytics in the side menu. Then select the “Position” option at the top of the page. Search Console Search Analytics. © Screenshot. Personalization — i.e., location of the user, search settings. John Mueller recommends that to help determine whether this is a factor, is to look at the number of impressions for that query. For example, if the number of Search queries for that term is high, but the number of impressions is low, that could indicate it is a personalization issue. Universal Search Results — i.e. where they show images at the top of page one on Google. This may be relevant whereby your web page is not ranked highly in Google for that term, but the Universal Search Results may show an image from your website related to that term. Images are counted as an impression \ ranking for the Search Console data. Mueller is saying that the Search Console rankings and impressions take into account much more than just the standard Web SERPs. Later in the hangout, the subject came up again. 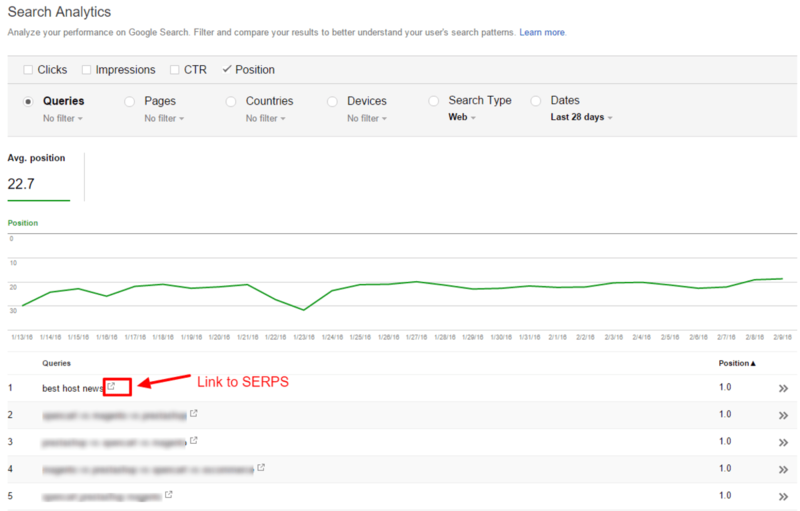 The example discussed related to a high traffic keyword “experience days” that was an exact match of the Domain. Despite many people searching for that term, the website experienced a very low click through rate. Mueller could not determine in this instance what may be causing the discrepancy, but if this kind of problem occurs for you, it is worth checking from different locales to try and see what users see, as this may help troubleshoot the problem.